Colin Davidson: Salt production is one of the earliest ‘industrial’ activities recorded in Hong Kong. Records indicate that salt-working probably began here in the third century BC, more than two thousand years ago. Because of the high profits that could be made, the salt industry was controlled as an Imperial Monopoly. 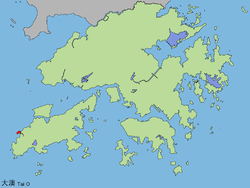 The earliest salt fields in the area were probably in the Deep Bay and Tuen Mun areas, with the Imperial Salt monopoly extending to Lantau Island in the tenth century AD. Salt fields were first constructed in Tai O in the mid/late eighteen century. Much of the output was smuggled out of Tai O to Macau, Hong Kong, the Pearl River Delta and through Hong Kong to other places on the coast. Following the arrival of the British, there was a formal decision that the Tai O salt industry should be encouraged and expanded. Apart from smuggling, Tai O salt was traded legitimately to the Philippines and some was sold within Hong Kong, mostly for industrial uses. 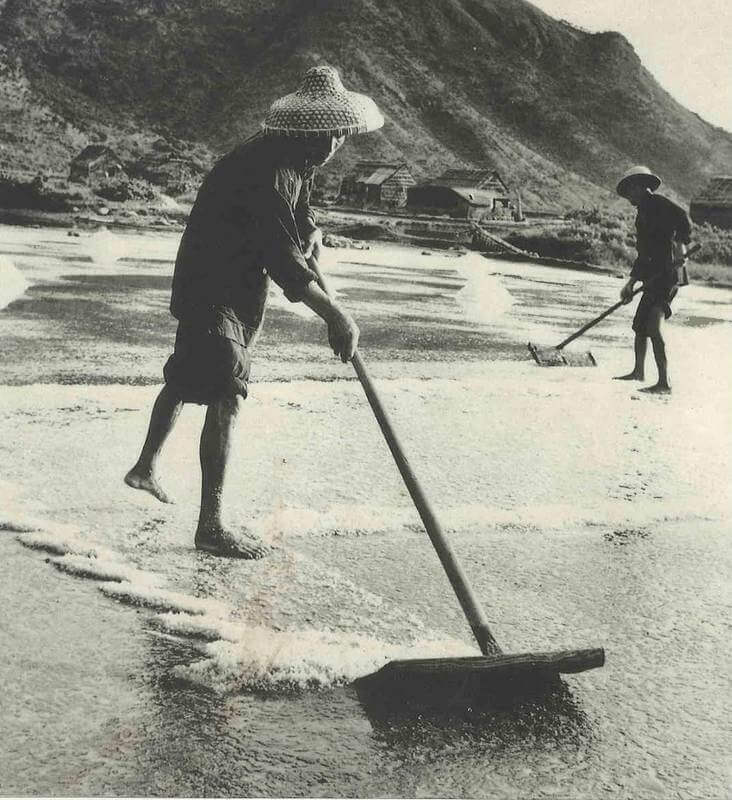 From 1936 onwards, the Japanese blockade of the coast of China removed foreign salt from the coastal areas of China, which encouraged a vast increase in the salt-smuggling trade out of Tai O. This had a profound effect on the attitudes and behavior of local society. This trade died away somewhat after the Japanese occupied Hong Kong, but was replaced with a boom trade in salt to Hong Kong and Macau, where foreign salt was no longer available. After the Second World War, the competition from foreign imported salt became overwhelming, and from 1955 to the mid 1960s the salt field operators gradually closed business. A few of the old salines continued to be worked by the old salt workers as squatters until 1967/70, when the construction of the Tai O road destroyed the sluice systems. Salt production reached its peak in the 1920s and 1930s, when there were about 102 acres of salt fields in Tai O, arranged in four areas on either side of the village. Salt farming was a seasonal activity. The fields were farmed between mid September and April of the following year, after which they were abandoned during the summer rainy season, when the salt field workers had no income. Some of them had to borrow money from the salt companies to survive these times. There were three salt companies before the Second World War: Yat Sing, Tin Sang and Hap Fung. All three companies had their own salt godowns or warehouses. In earlier days the salt was transported in sacks made of grass, which were very heavy. There were two salt farming methods. The first was known as “water funnel”. Sea water was channelled into the salt fields, after which in order to increase the salt content water was diverted from one field into the next. The process continued seven or eight times until the salt content of the water was so dense that a testing device, called a “Shek Lin Ji”, would float on the surface. Salt workers also showered the salt fields with condensed salt water from time to time, which was known as ”sowing salt seeds”. In the dry season, especially when the wind blew from the north, each salt field could produce over 60 kilograms of salt. The second salt-producing method was “sand funnel”. Pipelines were installed to draw sea water into a field. Salt workers would then dig the field loosely to mingle sand with the salt water. The salt water would then drain back into the pipelines and be led to other salt fields. Workers had to sow salt seeds to increase the salt content, and the same testing method was applied. If a sudden rain came in the middle of the night during a farming season, workers would need to rescue the salt product by immediately harvesting, or they would lose this crop. Today, very little remains of this once all important industry. The outline of some of fields may still be seen, defined by man-made bunds, but the fields have now become mangrove swamps or are disused fish traps. The memory of the old industry lingers in Tai O, where some of the older inhabitants remember the trade and a few relics may still be seen. However as the years pass, salt production in Tai O has become, perhaps sadly, confined to history. More information on any of these production centres would be useful. In 1940, it was recorded that the Tai Po salt marshes were covering 70 acres (280,000 m2) and that the production has amounted to 25,000 piculs (1,512 metric tons) in 1938. It’s a heritage/ecotourism project rather than industrial salt production – but they’re using the original salt pans which were abandoned in the ’70s.